Change your MONEY situation in 6 months or less! In order to receive money, you have to be willing to BE MONEY. Here's a taste of what we create in each reading...X-Men Style! ﻿In this video, you can hear from current class participants themselves! Check out what the Club Members are saying! My hubby and I are BOTH making more money! My asks and those of my hubby and family are showing up almost instantaneously! For the first time in a while, I am truly Joyful, Peaceful and Grateful every day. I finally know that I will pay off my past expenditures with ease. Thank you Patty is has been so amazing to have your Facilitation 2 times per week. I now have more ease, more expansion and less stress! Everything I've been working towards is happening! It was imperative to do lots of renovation on my family home to put it on the market… and I paid for all the improvements with ease joy & glory instead of anger resentment . I just sold my house for $7,500 above the asking price! AND, my brother is going to pay me back for all of the work that was done ! This Club helped me tremendously to get through that! When I came to the Club, I was broke, homeless and jobless. Today, I have my own place, A growing healing business and joy beyond my wildest imagination! Money is flowing in with so much more ease now! I created the money for the Global Foundation!! At Christmas, I wanted to send my son money. One day, there was no money and then suddenly there was money in the account! Ask and you shall receive really works! My husband just had a birthday last week, I wanted to give him money, then somebody overpaid me for a lesson, so I gave it to him! "I got a raise! I feel a lot more ease with money and the pressure around money has dissipated." You are saying NO to the things you'd like to have because you "don't have the money"
You never had to worry about money? 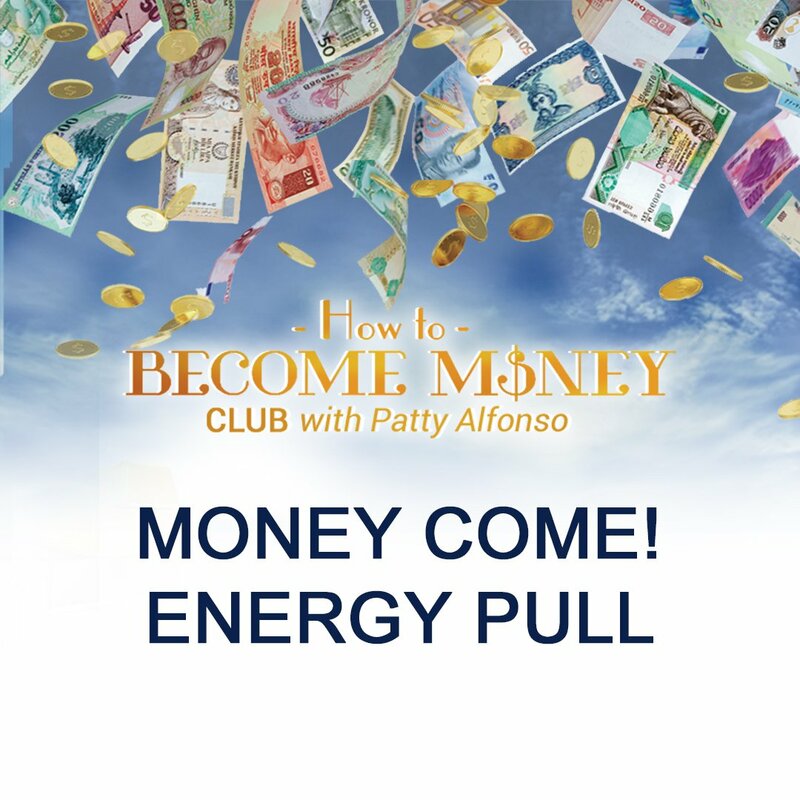 Having money was easy, fun and joyful? You could have peace with money? No matter what your current financial situation is? You had way too much money to spend AND never enough? You could receive unlimited amounts of money from everywhere? Your new Financial Reality Begins March 3rd! First of all, this isn't like any book on money you've ever read. There's no fluff or filler - just tried and true tools that WORK. And it's easy to read. Besides, we will be reading it together on our weekly calls! 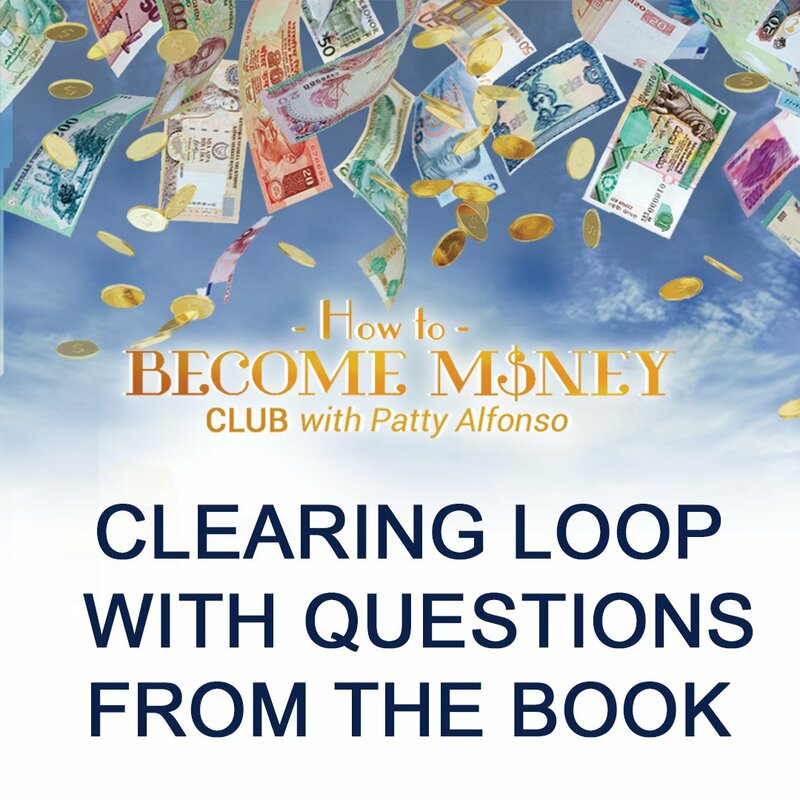 Weekly Readings and Facilitation from the How To Become Money Workbook. We'll meet every Sunday at 10 AM PT. Click here to find your time. Weekly Facebook Deep Dive LIVE Events for additional questions and energy pulls! ﻿Our Facebook Live Events will be every Thursday at 10 AM PT. Click here to find your time. Special Bonuses created just for this Club Membership: Available immediately upon registration. Get those details below...How does it get any better than that? Don't worry if you can't make a call, everything will be recorded and available for you to listen to later. YES! I'll have a totally different reality! I am commiting to me for 6 months! Gain access to these right away! 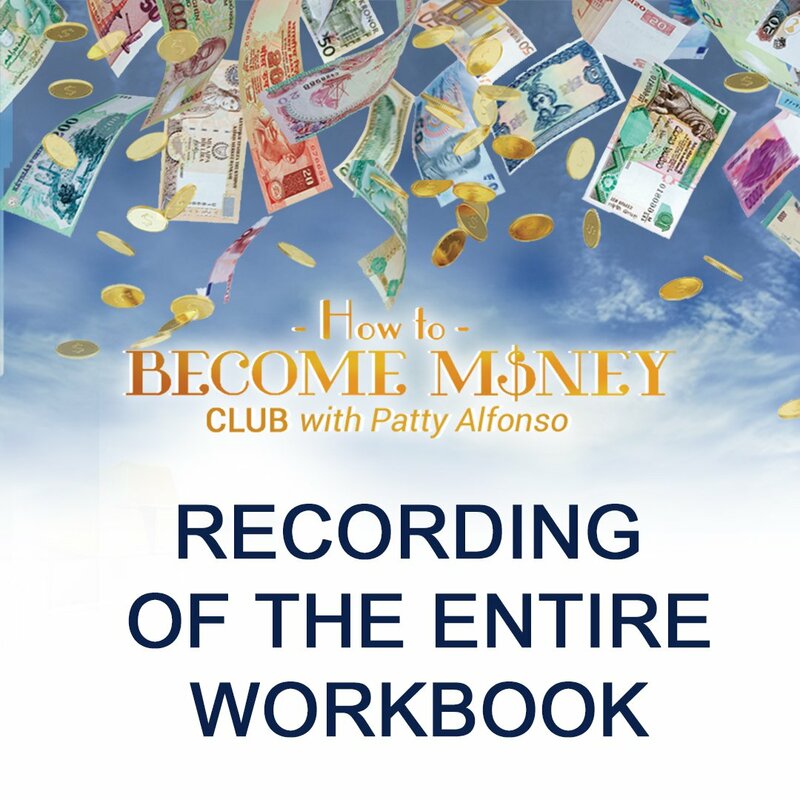 Workbook read by Patty Alfonso and Friends. it create if you played this recording at night while you slept? The "I am" statements in the book! Imagine what it would be like to get started with this loop TODAY!!! 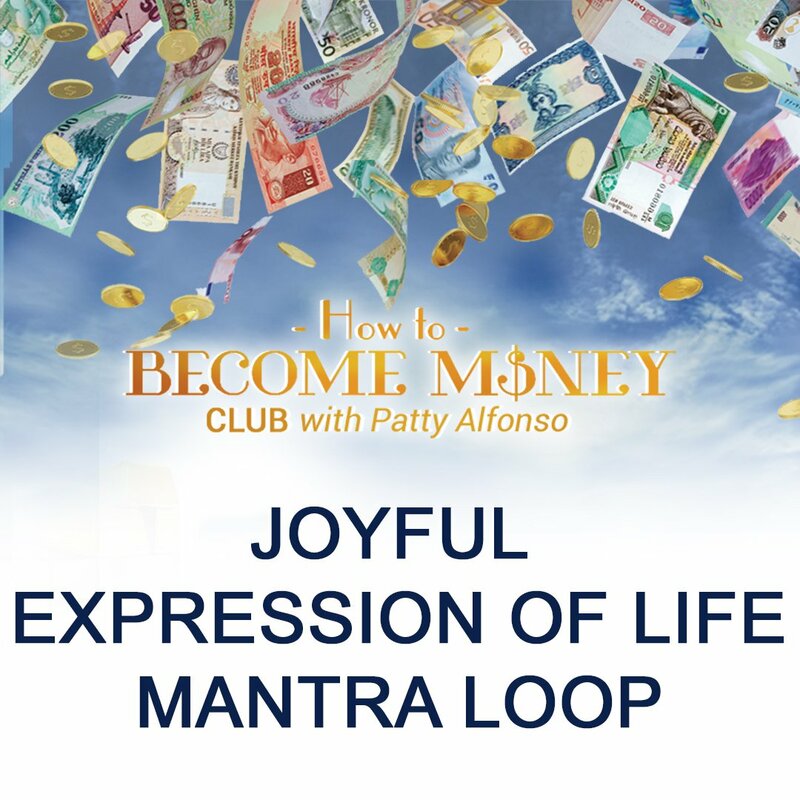 An audio loop with the Joyful Expression of Life Mantra that is given in the book. I've been playing this one for myself and WOW...the joy that is in my life right now is beyond! What would your life be like if joy was one of dominant energies in your life? Access to (4) Amazing Bonuses right away! 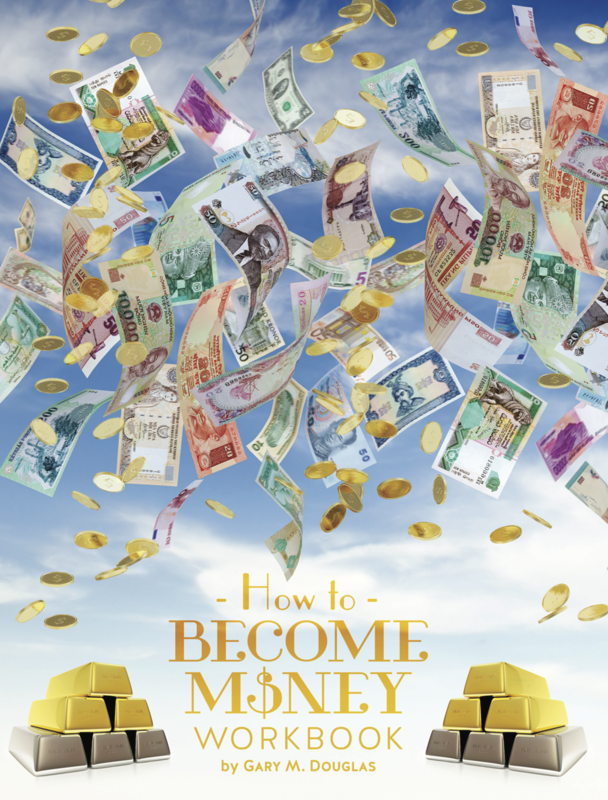 How to Become Money Workbook HERE! Or click the image to purchase the workbook. "I Just Don't Have the Time..."
"A six month commitment is too long." What is it that you are really committing to? You are committing to you! Let’s fast forward a year from now and assume you’ve been reading and using the tools in the How to Become Money Workbook. **Your finances have been totally transformed. **Your financial reality is different. **You no longer function from scarcity. **You don’t struggle to pay your bills. **You receive unlimited amounts of money from anywhere. **And you've started HAVING money rather than constantly spending it. How does it get any easier than that?! I am commiting me for 6 months!